The larger of the Bicton again is a striking obelisk that will provide height in your borders above low level planting, adding a different dimension to your borders. This garden obelisk support when covered with flowers, or simply showing off its clean lines, it cannot help but add interest to your garden. A striking obelisk that will provide height in your borders above low level planting, adding a different dimension to your borders. This garden obelisk support when covered with flowers, or simply showing off its clean lines, it cannot help but add interest to your garden. Grouped together, scattered throughout the borders, or simply placed in separate places in your garden, this set of three obelisks gives the opportunity to create a unique and stunning display of climbing plants. Try planting two or three plants from the same family, but of different colours, for some really dramatic effects. Made from metal with a black covering to offer protection against rusting and weathering. This triple pack of garden obelisks include: 1.1 metres, 1.5 metres and 1.7 metres high. 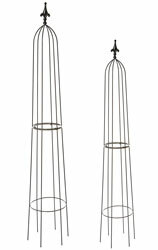 This pack of two garden obelisks when placed together will make a feature in your borders, or even out in the open, with this piece of drama. Add some climbers such as Tropaeolum, or Flame Flower for an amazing display. Made from steel with a black covering to offer protection against rusting and weathering. 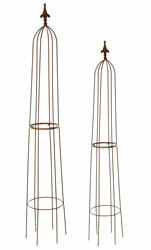 This twin pack of plant obelisks each measure 1.6 metres (160cm) high. This pack of 2 garden obelisks cannot help but be a major point of interest in your garden. With an attractive finial atop, the impact will be made with or without climbing plants smothering it. Try perhaps planting a golden hop to clamber up through its supports. Made from steel with a black covering to offer protection against rusting and weathering. Each of these garden obelisks is 1.7 metres (170cm) high. This stylish Chatsworth garden obelisk is the smallest in the range, manufactured from black plastic coated steel for protection against the weather. Create a vertical garden by placing the large metal garden obelisk towards the back of your flower beds, and grow climbing plants up through it, maybe flowering plants, or, if you have a small garden, use it as a garden plant support for growing vegetables such as runner beans or tomatoes. Add interest to your garden with these tall obelisks. Clad in climbers, they present another dimension to your planting options. Could also be positioned in large containers to dramatically enhance your patio. This garden plant support is British manufactured from heavy duty steel rod with PVC coating for durability. 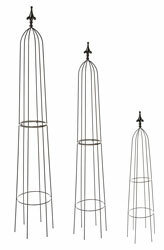 This pack of three stunning garden obelisks positioned carefully in your garden, will change the visual balance of your planting schemes. This garden support finished off with a feature finial, it would look good with climbing plants weaving through it. Try a passion flower for impact. These obelisks are hand-made in Yorkshire from solid round rod and finished with black coating to offer protection against our weather conditions. These iron plant supports will look great in your borders by grouping three or more obelisks together for a spectacular vision. Garden designers say that special plants should be grouped in threes of fives, especially if all clothed in matching climbing plants, such as sweet peas, or nasturtiums. These metal plant supports are handcrafted obelisks are plastic coated to make them weather resistant. These iron garden obelisk are made in the UK. These climbing plant support obelisks are a perfect combination of plant support and garden statuary. This plant obelisk is clothe the lower sections with climbing flowers, so the orb seems to be floating above the blooms. 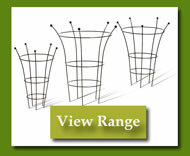 The garden plant support come in three sections are easily assembled to create immediate impact in your garden. This stunning new obelisk for this season is again made in the UK from solid rod steel and then plastic coated to offer long life and durability. This obelisk is design to create extra height and impact in the garden. Perfect garden structure for use with variety of climbing plants. This obelisk breaks down into two sections, which bolt together easily. This stunning new obelisk for this season is again made in the UK from solid rod steel and then plastic coated to offer long life and durability. This obelisk is design to create extra height and impact in the garden. Perfect garden structure for use with variety of climbing plants. This garden obelisk is a simple and stylish obelisk with a ball top. Made from heavy duty steel construction with coated black finish. These metal garden obelisks will offer good support to different types of climbimg plant as well as adding interest to your garden borders. Simple to use, one piece construction with spiked feet, just push into the ground or plant trough to secure. This simple designed garden obelisk is made from heavy duty rod construction to form an elegant garden obelisk with a teardrop finial top. These climbing plant obelisks are finished in black coated finish. Click here for larger image of Byland Obelisk.. This English rose garden obelisk is part of the English rose collection. These plant obelisks are made from steel with a painted cream finish. This is a decorative rose obelisk with intricate rose design. Size: 160cm high x 30cm diameter base. This Nature garden obelisk is made from steel with a bronze effect finish. This garden obelisk is from the Signature nature range. These rustic iron garden obelisk has an bird and leaf design with spiked feet to ensure secure fixing into garden borders and planters. Size: 1.6 meteres high. Base diameter 30cm. This Loire garden obelisk is made from steel with a white-grey wash effect finish. This garden obelisk is from the Signature loire range. These iron garden obelisk has a scrolled design with spiked feet to ensure secure fixing into garden borders and planters. Size: 1.6 meteres high. Base diameter: 30cm. This versailles garden obelisk is made from steel with a bronze effect finish. This garden obelsik is from the Signature range. These steel garden obelisk has spiked feet to ensure secure fixing into garden borders and planters. Size: 1.6 meteres high. Base: 30cm x 30cm. These extra large garden obelisks are great value for money obelisks and unique design. These obelisks are Ideal for any size garden. This metal garden obelisk is manufactured in Great Britain from heavy gauge steel construction and then powder coated for long life. These metal garden obelisks have detailed spiral finials. These extra large metal obelisks create a stunning border or patio feature. This metal obelisk made from plastic coated steel for long life with attractive barley twist finial.. These metal garden obelisks are ideal for sweet peas, honey suckle and rambling rose. These metal garden obelisks creates decorative feature in minutes. Size: 2.2 metres high. Base 36cm x 36cm. These metal obelisks create a stunning border or patio feature. This metal obelisk made from plastic coated steel for long life with attractive barley twist finial.. These metal garden obelisks are ideal for sweet peas, honey suckle and rambling rose. These metal garden obelisks creates decorative feature in minutes. Size: 1.5m (60") high. Base size: 25cm x 25cm. These metal garden obelisks have rustic comtemporary design. This folding garden obelisk has spiked feet for secure fixing. Size: 1.6 metres. Base 23cm x 23cm. These garden obelisks are made from one piece steel rod construction. This garden obelisk is finished with a black PVC coating for long-life. These steel obelisks are excellent quality hand made in the UK. These obelisks feature a spiral finial top. Size: 1.7 metres high - Base 30cm diameter. Size: 1.5 metres high - Base 25cm diameter. Size: 1 metre high - Base 20cm diameter. This unique design garden obelisk is manufactured to the highest standard from heavy-duty steel and black pvc coated for long-life. These garden obelisk perfect for containers and borders. 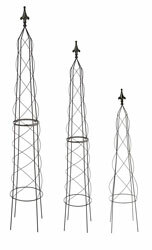 These metal garden obelisks are traditional decorative design in durable wire. Metal garden obelisk have spiked feet for secure fixing. These obelisks for garden creation. Ideal for long stemmed and climbing plants. These garden obelisks create a decorative practical feature in minutes. Size: 1.5 metres high. Base diameter: 33cm. Size: 1.2m (48") high. Base diameter: 30cm. Size: 0.9m (36") high. Base diameter: 28cm. Heavy Duty 54cm Natural Rusty Peony Support - 5 Leg. Are traditional decorative design in durable wire. Metal garden obelisk have spiked feet for secure fixing. These obelisks for garden creation. Ideal for long stemmed and climbing plants. These garden obelisks create a decorative practical feature in minutes. This unique contemporary design of garden obelisk gives adds a sculptural feature to any garden. All of the metal garden obelisks are manufactured from top quality materials. Black metal garden obelisk designed to suit a range of locations from the classic cottage garden to a more contemporary home and garden. These rose obelisks are manufactured from heavy duty steel. This metal obelisk creates height in garden borders, containers and flower beds. These steel obelisks are highly attractive innovative design. The smooth new styling of this obelisk makes it an ideal addition to your garden. The elegant lines and the striking finial of this obelisk make it a must for your borders. Individually hand made one piece steel construction, and coated with a protective plastic coating, it is an item of charm and durability adding interest in your garden. These garden obelisks are made from steel and coated black. Ideal to add height to borders and beds. Leaf design adds detail and interest. These garden obelisks are our swirl design. Made from coated steel rod. These metal climbing obelisks are ideal for beds, garden borders and containers which will add height and interest to your garden.. This modern obelisk has a spiral twist design, with a ornate twist finial. All of the metal garden obelisks are manufactured from top quality materials. Black metal garden obelisk designed to suit a range of locations from the classic cottage garden to a more contemporary home and garden. 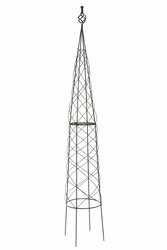 These rose obelisks are manufactured from heavy duty steel. This metal obelisk creates height in garden borders, containers and flower beds. These steel obelisks are highly attractive innovative design. These garden obelisk are a traditional decorative design. Metal garden obelisk have spiked feet for secure fixing. These obelisks for garden creation. Ideal for long stemmed and climbing plants. These garden obelisks create a decorative practical feature in minutes. These metal obelisks have a contemporary design. This metal obelisk made from plastic coated steel for long life. 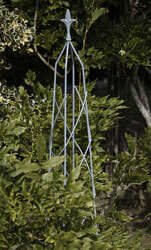 These metal garden obelisks are ideal for all climbing plants. These metal garden obelisks creates a decorative feature in minutes. These metal obelisks have a modern square design. This metal obelisk made from plastic coated steel for long life. 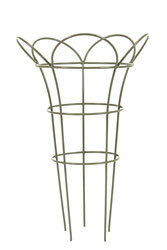 These metal garden obelisks are ideal for all climbing plants. These metal garden obelisks creates a decorative feature in minutes. These metal obelisks have a Art Deco design with a spiral finial. This metal obelisk made from plastic coated steel for long life. 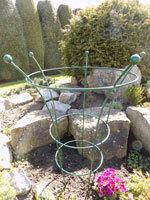 These metal garden obelisks are ideal for all climbing plants. These metal garden obelisks creates a decorative feature in minutes. 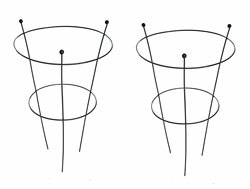 These pot obelisks are designed to be used in plant containers. This garden obelisk has spiked feet for secure fixing in pots and borders. This pot obelsik will make a stunning feature. These metal obelisks are a traditionally styled obelisk. This metal obelisk made from plastic coated steel for long life. 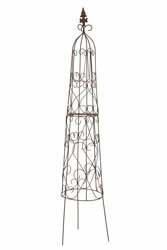 These metal garden obelisks are ideal for all climbing plants. These metal garden obelisks creates a decorative feature in minutes. These metal obelisks have a highly decorative design. This metal obelisk made from plastic coated steel for long life. These metal garden obelisks are ideal for all climbing plants and spiked feet for secure fixing. These metal garden obelisks creates a decorative feature in minutes. This large metal garden obelisk will add height to your garden borders. These metal obelisk for gardens are made from steel and then plastic coated black for long life. Size of plant obelisk: 2.4 metres high. These supersize garden obelisks are great value for money obelisks and unique design. These obelisks are Ideal for any size garden. This metal garden obelisk is manufactured in Great Britain from heavy gauge steel construction and then powder coated for long life. These metal garden obelisks have detailed spiral finials. 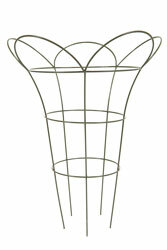 These twist garden obelisks are great value for money obelisks and unique design. These obelisks are Ideal for any size garden. This metal garden obelisk is manufactured in Great Britain from heavy gauge steel construction and then powder coated for long life. These metal garden obelisks have detailed spiral finials. Size 160cm (63") Stunning garden obelisk. This garden obelisk is made in Great Britain. 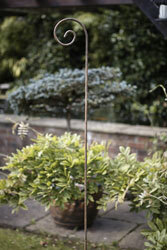 This metal garden obelisk has an attractive feature ball designed obelisk. These iron garden obelisks are a top quality product. These metal garden obelisks are made from heavy duty steel and then power coated for long life. This obelisk for gardens is ideal for the climbing plants. 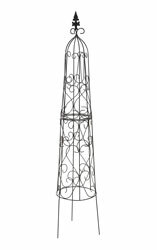 This decorative round iron obelisk is ideal for most climbing plants. These obelisk plant supports are made from steel with weather proof finish. This garden metal obelisk is made from steel and black PVC coated for long life. These garden obelisks offer an contemporary design with good design. This garden metal obelisk is made from steel and black PVC coated for long life. These obelisks offer an contemporary design with good design. 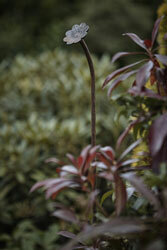 This new range for 2013 is a handmade in Yorkshire stunning climbing plant obelisk. These Sovereign Obelisks are designed to have an instant visual factor in your garden with a scrolled decorative finial top finish. These garden metal obelisks are a one piece construction and are made from heavy duty solid steel rod with a black plastic coated finish to withstand the British weather. ideal obelisks for use in garden border. This new range for 2013 is a handmade in Yorkshire stunning climbing plant obelisk. These Large Sovereign Obelisks are designed to have an instant visual factor in your garden with a scrolled decorative finial top finish. These garden iron obelisks are a one piece construction and are made from heavy duty solid steel rod with a black plastic coated finish to withstand the British weather. ideal obelisks for use in garden border. This new range for 2013 is a handmade in Yorkshire stunning climbing plant obelisk. These Extra Large Sovereign Obelisks are designed to have an instant visual factor in your garden with a scrolled decorative finial top finish. These garden iron obelisks are a two piece construction and are made from heavy duty solid steel rod with a black plastic coated finish to withstand the British weather. ideal obelisks for use in garden border. THIS UNIQUE BLACK METAL TRELLIS OBELISK WILL GRACE ALL GARDENS - MODERN OR TRADITIONAL. IT IS 1.75m (70") IN HEIGHT. IDEAL FOR ALL CLIMBING PLANTS. These very attractive square based obelisks for garden will make a striking feature in your garden. This support for climbing plants make a detailed leaf design with ornate featured top. Made from steel and finished with Chestnut colour coating. These very attractive square based iron garden obelisk will make a striking feature in your garden. This support for climbing plants has detailed scrolled design with ornate featured top. Made from steel and finished with Oyster colour coating. This iron support has four columns ideal for clematis climbing plants. 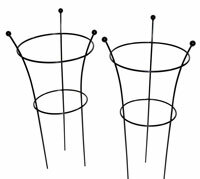 These wigwam obelisk supports will give support to your climbing plant from strong winds. This garden obelisk cane be pushed directly into larger planter or into the ground. This clematis support has spiral decoration with four top spheres. Made from heavy duty iron rod with Black plastic coating to withstand weather. This garden obelisk is made in the UK and is known as the crooked garden obelisk made from heavy-duty steel rod with PVC coating to prevent rusting. 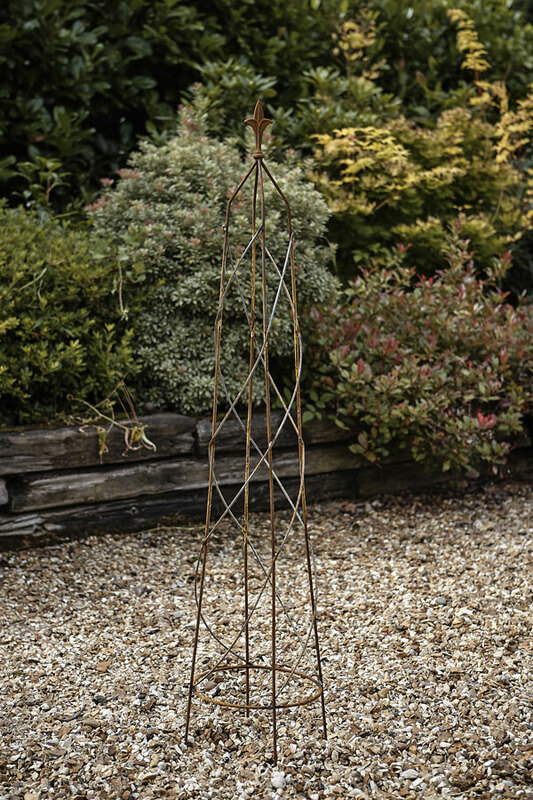 These garden obelisks are made in the UK and is known as the crooked garden obelisk made from heavy-duty steel rod with PVC coating to prevent rusting. This standard tubular steel garden obelisk is made from steel with green plastic coating finish. Ideal for most climbing plants and is suitable for use in lawn borders and garden troughs. Size: 133cm height after been fitted into the ground for stability. We have more Handcrafted Garden Obelisks please click on the image to view more. Please take a look at our expanding diamond garden trellis. Ideal for offer support to herbaceous plants. Please take a look at our Brand New range of planter with obelisks. These obelisk planters are new for this season.